On Friday, Vendio released “Reports”, a product designed not only to give sellers data about their sales and costs, but to allow sellers to set conditions (cost assumptions) and to make adjustments to their reports for expenses and income that have just not been available to sellers in the past. Reports can be used by anyone using Vendio to list their items (including Vendio Store sellers) and data is presented by marketplace – Vendio Stores, eBay, Amazon and even items added to existing orders or created directly on Vendio. There are four main reports, sales, tax, costs and profits and snapshot graphs are displayed for each of the reports. 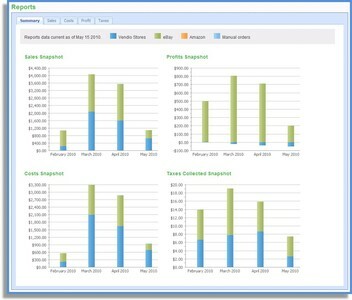 The snapshot graphs contain three months and the current month to date, giving an accurate at-a-glance view of your business. In addition, detailed reports can be downloaded for sales, costs, profits and taxes and contain all the fields you need to have accurate and up-to-date data on your business. One innovated and new feature of Reports is the ability to make manual adjustments and cost assumptions. Because this is probably a new concept to sellers – I want to spend the majority of this blog post on these two areas and provide examples where merchants would use these features. Manual adjustments provide a method for you to periodically make manual adjustment to your report data. Manual adjustment includes such things as packing material, the difference in postage costs, etc. Adjustments will reflect in your charts and graphs within 24 hours, so any applied costs or income will be displayed in your snapshot graphs and charts. Manual adjustments can be done daily, weekly, monthly (or even longer out if you prefer). For the examples below, we will use monthly, as you probably will want to aggregate your entries vs. trying to update every day. • You charge $3.00 shipping per item and you shipped 100 items for a total of $300.00 charged to buyers. Your actual postage cost for the month was $295.00 thus your cost was less than Vendio reports displays. Enter the date, the amount you reduced your costs (-$5.00) and an explanation (i.e. June Shipping Adjustment). Note: Any item your enter that REDUCES your costs is entered as a negative number. Cost assumptions allow you to override or change the default settings that reports uses to calculate your data. Cost assumptions for shipping, insurance and handling are defaulted to the amount that you charge your buyer. Additional cost assumptions are available for Payment methods and item cost. • You use authorize net and want Reports to calculate your payment costs. Under cost assumptions, add the % that is charged as well as the cost per order that authorize.net charges you. • You charge handling, but it does not cost you what you are charging. Under cost assumptions, enter the amount that handling costs you per order. • You charge insurance, but it does not cost you what you are charging. Under cost assumptions, enter the amount per order that you typically pay for insurance. • You charge $5.00 shipping per item; however, it costs you on average $2.00 per order. Under cost assumptions, enter $2.00 per order. • You offer free shipping on some of your items. On the items where you offer free shipping, the average cost is $3.00. Under cost assumptions, enter $3.00 in the free shipping per order section. This entry was posted on Tuesday, August 24th, 2010 at 8:23 am	and is filed under Vendio Platform. You can follow any responses to this entry through the RSS 2.0 feed. Both comments and pings are currently closed.